You never know where you might find some cool swag. I was walking the aisles of a gigantic classic car swap meet when I stumbled onto this piece of Beatles history tucked in among the shop manuals for ’65 Dodges and showroom brochures for fine vehicles from your friends at AMC Motors. I paid a whopping five bucks, which might seem like a bit much for 50 year-old junk mail, but just look at what I got for my five bones. 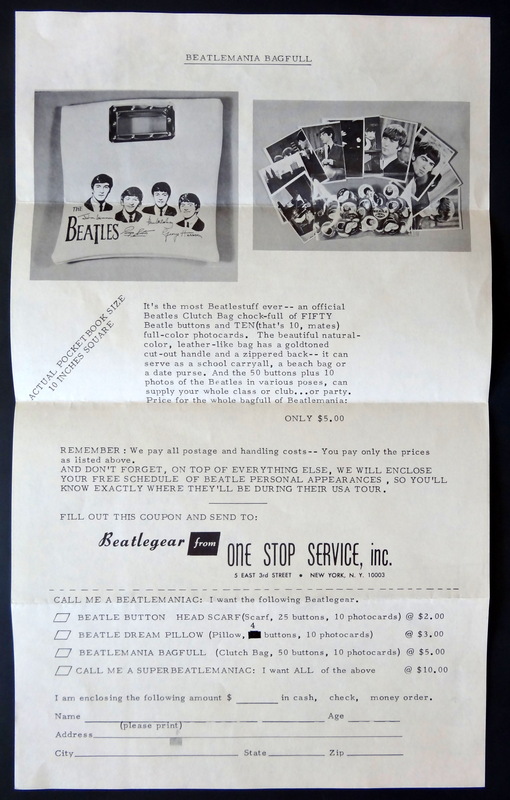 And just look at what the clearly female fan could get for five 1964 dollars: A “Beatles Clutch Bag” containing 50 buttons and 10 “full-color photocards…of the Beatles in various poses.” Just the bag sell these days for around $300. Even if we estimate the 60 enclosed items at a conservative five bucks each, there’s another $300. Not a bad return on a five dollar investment. 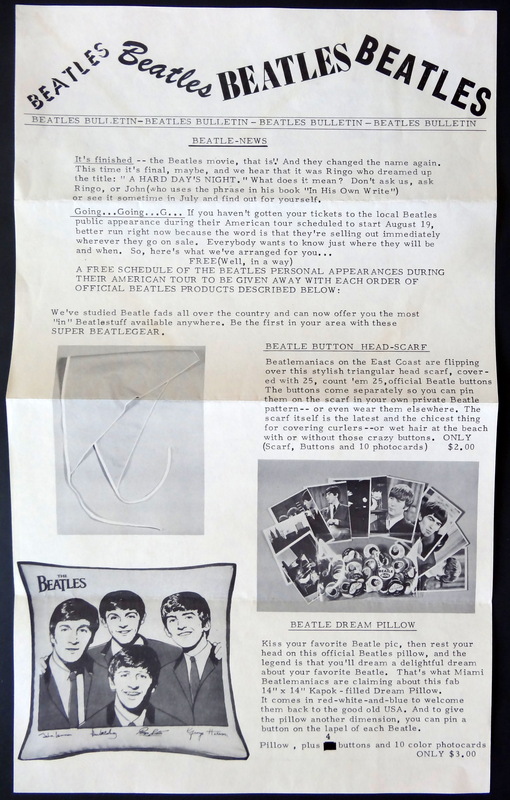 Of equal if not greater coolness is the “Beatle-News” section of the mailer, which promotes both the upcoming release of A Hard Day’s Night and the kickoff of the Fabs’ first U.S. tour, which started at San Francisco’s Cow Palace on the evening of August 19, 1964. 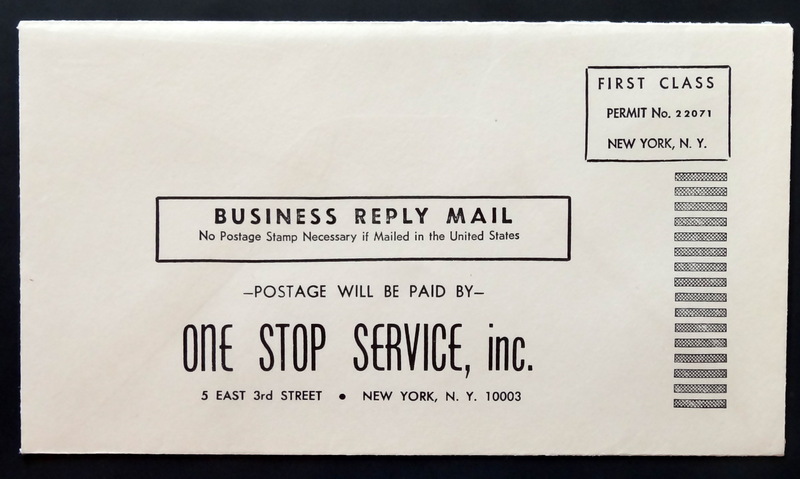 But the real kicker for me is the original mailing envelope, which provides both a postmark establishing the artifact’s provenance and the name of its original recipient. I love the idea of little Kathy Nowack from Buffalo, New York, screaming when she finally received her long sought order form. I wonder if Kathy regrets not at least springing for the $3.00 Beatles pillow, which not only could she have practiced her kissing on but like the Beatles Clutch Bag goes today for around $300. My guess is that this “Beatles Bulletin” is probably a pretty common item in Beatles collector circles, but I can’t seem to find a comparable copy for sale on line. Let’s just assume that the five bucks I paid is what you can expect to pay if you happen to find one. Happy hunting. That head-scarf is the chicest! Glad you like it, since I got you three for Christmas.